I am running an acer aspire laptop 5720 on windows 7 OS service pack 1, Intel (R) Core (TM)2 duo CPU T7300 @2.00GHz with 2GB ram and a 32 bit system. I wondered if anyone can check out my logs I have created as per the instructions in the help section of this forum before posting, I have attached the malware, antispyware and the hijack this logs. For some reason your system denied access to the hosts file. If any hijacked domains are in this file, hijack this may Not be able to fix this. I am already using the avast anti virus system which I have always used. O4 - HKLM\..\Run: [DRPU PC Management - Basic] "C:\Program Files\DRPU PC Management - Basic\Basic Manage.exe" "hd"
O4 - HKLM\..\Run: [SpeetItUpFree] "C:\Program Files\SpeedItup Free\speeditupfree.exe"
I Hope I have completed the instructions you sent me and that they are correct. I only had time to do them this morning. mRun: [lxdimon.exe] "c:\program files\lexmark 3500-4500 series\lxdimon.exe"
mRun: [lxdiamon] "c:\program files\lexmark 3500-4500 series\lxdiamon.exe"
mRun: [DRPU PC Management - Basic] "c:\program files\drpu pc management - basic\Basic Manage.exe" "hd"
mRun: [SpeetItUpFree] "c:\program files\speeditup free\speeditupfree.exe"
22:24:14.0000 5804	Scan interrupted by user! 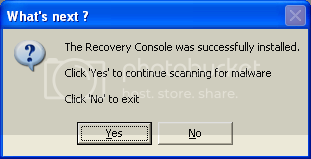 Yes, please try re-installing IE9.